One of the things the SNP like to talk about at length is their commitment to ridding Scotland of nuclear weapons. The anti-nuclear stance is one of the few pieces of political radicalism, along with free education, to have remained in the SNP manifesto pack. It is then all the more surprising that the same government is happy to award contracts to an outsourcing company actively engaged in the maintenance of the United Kingdom’s nuclear arsenal. Serco, accurately described as ‘the biggest company you’ve never heard of’ are one of the largest outsourcers in the world, running public contracts in myriad areas from transport to weapons technology, data management and prisons. Late last year they were the subject of an investigation by the UK Serious Fraud Office for their work electronically tagging prisoners (along with private security contractor G4S). Through a partnership contract, Serco Denholm, the company also provides a range of services at HMNB Clyde, of which the Faslane nuclear base is part. 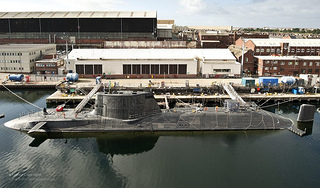 The contract with the Warship Support Agency, an arm of the MoD, includes support to the movement and training excercises of Vanguard nuclear submarines. The Faslane submarines are the delivery mechanism for the UK’s roaming Trident nuclear deterrent. Only people within the SNP can say whether anybody failed to see the link between a lucrative contract for the Caledonian Sleeper and Serco’s nuclear and defence work, but it makes the SNP hardline on public services and moral superiority look a little weaker. Serco already run the ferries to Shetland and Orkney after winning the contract from publicly-owned Caledonian MacBrayne a few years ago, banking £254m pounds in the process. The new Caledonian Sleeper franchise also sees an injection of £100m of public money toward new trains, to be owned by a private rolling stock leasing company. The London model is more like us than we’d maybe wish to think. Sitting in the foyer of the Citibank building in Canary Wharf, where the trains have no drivers and the supermarkets no checkout staff, Scotland seems a long way away. For many in the independence movement the heart of Britain’s financial industry is the antithesis of everything they want to see in a country. A few miles north, in trendy Hackney (the hipster who attempted a citizen’s arrest on Tony Blair and wrote about it in the Guardian walked past me with his girlfriend) the Olympic park and its adjoining shopping centre lie on one side, on the other former warehouses converted into breweries and arts centres. A woman from the Green Party of England and Wales offers me an anti fracking leaflet and the bar is selling bottles of Schiehallion. Down the road in Shoreditch there’s a festival going on of ‘Nordicana’. I don’t go – it’s 25 quid a ticket – but if I had I’d have been able to eat Scandinavian food and ask fawning questions of the stars of Borgen, The Killing and The Bridge. We would probably have talked about how edgy the shows were and how lovely the cakes in the café are, like watching the Wire with a grab bag of American popcorn and a Budweiser. If you really want genuine though go a few miles further east still, to Upton Park at the flashpoint between what remains of East London’s white working class mixed with monied and hair-gelled Essex fringe dwellers and the vibrant South-Asian communities that have made Green Street and the area around West Ham’s stadium their own. Inside it might still be 1980 – there isn’t an Asian face to be seen and men wear long coats and caps over impressively engineered haircuts. In front of me David James does a TV spot. Bobby Moore looks on, England is intact and unchanging. West Ham are one of the best clubs in the country. Men stand smoking in the toilets under the banks of seating, convinced of the superiority of their team like Celtic fans living in 1967. The only Bridge they worry about is the Chelsea one. Thanks to Andrew Smith for today’s guest post: Andrew is a spokesperson for Campaign Against Arms Trade and tweets here. One of the most positive contributions to the independence debate has been the Scottish Government’s recent commitment to a ‘do no harm’ exports policy in the event of a Yes vote. I was very impressed, but I wanted to know more about which governments Yousaf and his colleagues see as ‘brutal dictators’ and which they see as potential partners. The UK’s links with regimes that abuse human rights are well known, so I contacted Yousaf on Twitter to ask him to clarify what criteria the Scottish Government would hope to apply in an independent Scotland. The problem is that the Swedish policy has almost as many inconsistencies and contradictions as the UK one. Swedish exports from 2012 included €57 million worth of military exports to Algeria and €6.5 million to Bahrain. If we look to 2011, Sweden’s largest customers included Saudi Arabia, to whom they sold almost €500,000,000 of military equipment, and UAE, who bought over €70 million. Although it could be argued that the Swedish policy is an improvement on the UK’s one, it’s also clear that it’s a policy to be challenged rather than replicated. A disappointing aspect of the recent debates about the impact of Scottish independence on jobs in the Govan shipyard and Rosyth naval base is that they have focused almost entirely on how the status quo can be maintained. Very few voices have focused on the ways in which the Scottish Government can encourage a more positive and constructive manufacturing sector, with less focus on military industry and the arms trade. Yousaf’s goal is admirable, but it needs to be underpinned by a greater clarity. According to the Scottish Council for Development & Industry, there are 185 arms companies with offices in Scotland, which employ 12,600 skilled workers and account for annual sales of £1.8 billion, so what happens to them is obviously a matter of concern. One of the most thoughtful responses to the launch of the White Paper came from the Unite union’s Scottish Secretary, Pat Rafferty, who said “We also believe there is a case for the creation of a Scottish defence diversification agency to help offset the employment impact on the proposed removal of Trident.” With a wider brief, such an agency could also examine alternative work for the other people currently employed in the military industry in Scotland. Not only would a ‘do no harm’ foreign policy present fresh and ambitious new thinking on an area that is traditionally done in the dark, but in the short term it would set a challenge to pro-union campaigners to look at the impact UK arms exports have on global peace, security and human rights and reflect on how this can be improved. This isn’t the first time that a high ranking politician has spoken about the need to make human rights central to foreign policy. In 1997 the late UK foreign secretary, Robin Cook, spoke about the need for a foreign policy with human rights at its heart. He also argued for the conversion of military industry to socially useful production. Unfortunately neither of these goals were realised, but Scottish people should remember his arguments and take warning from his failures, whether in an independent Scotland or as part of the UK. Not respecting ’our’ troops is one of the biggest taboos in politics. Armed Forces Day is a most bizarre invention, plucked from the ether by politicians to justify support for various overseas expeditions and to placate the military establishment. The cult of military heroism in Britain is absolutely bizarre. It has created a climate in which everyone is a hero, even those people who have ambivalently signed up to the military due to a lack of options at home for reasons of class, education or general unemployment. A few years ago the Army started recruiting via Spotify, running adverts that began with a supermarket checkout beep and contrasted the low-paid monotony of Tesco jobs and dead end college courses with the excitement of sitting on top of a tank with your mates carrying guns. This whole recruitment ethos was lampooned in Gary: Tank Commander and the central character’s bemused reaction to being hailed a hero on his return to Glasgow Airport. The other odd thing is that we already have a day set aside each year to remember all those lost to war and conflict, though of late Remembrance Day has been appropriated by the jingoistic people who emphasise the Great in Great Britain and turned into a celebration of war which makes it uncomfortable for anyone not into military cheerleading. Armed Forces day in Scotland is also a chance for the unreconstructed Union Jack wavers to have a day out and assert some sort of made up connection between Scotland and military expeditions – the recent article in the Scotsman by Major General Andrew Mackay in which Scots were described as ‘a warrior race’ being a case in point. Since the referendum has been on the radar this also plays in to a particularly nasty kind of militaristic British nationalism, typified by the appallingly small-minded rhetoric of ForcesTogether and its attempts to construct the United Kingdom as some sort of military brotherhood. Not by coincidence, the report which General Mackay authored was commissioned by a private think tank, the Scotland institute, set up and funded by a multi-millionaire former Territorial Army member. I’ll respect our troops for the people they are, and I’ll remember the kid I went to primary school with killed by a roadside bomb in Basra, and I’ll support the member of my extended family who went into the RAF after being repeatedly failed by the school system, but I will not do it on Armed Forces Day.